Occasionally on Food Stuff Finds I come across items in the store that I know are going to be disappointing, the only question is the exact nature of that disappointment and it's scale. A slightly different multi nationality store has opened up near me in Cape Hill, Birmingham and instead of buying all the wonderful Turkish baked goods, and even passing up 4 fresh naan for a pound I went for the children snacks. 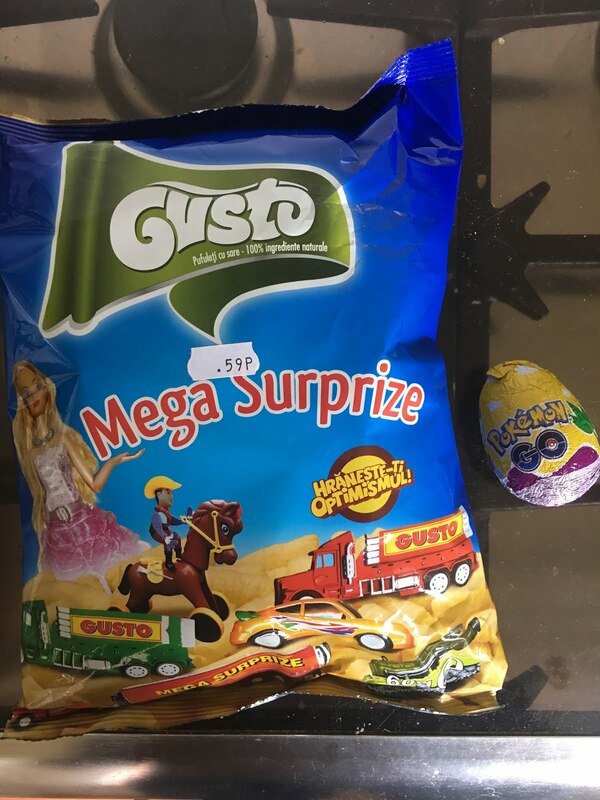 Up for review then in today's Disappointment Wars is a bag of Romanian crisps with a toy, and a knock off Pokemon Go surprise egg. Both were around the same price of 50p. The challenge is this - which has the most disappointing food element, and which has the most disappointing toy element? Would either actually be considered good value? Gusto I've not seen before, the internet assures me that it's Romanian. This is essentially a bag of puffed up crisps, where the single appealing factor on the packaging is the Mega Surprise toy. The bag is 59p though - and it's pretty large too. Factoring in the price of the crisps, and that some poor lorry driver had to drive these over from the mainland the prizes seem unrealistic. 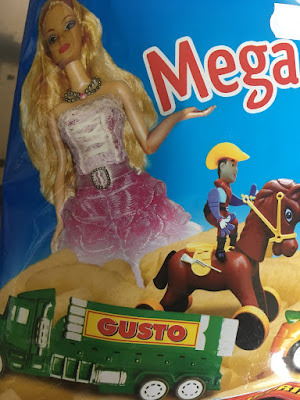 If I got a pound-shop Barbie, a knock off Toy Story set - or the holy grail - a Gusto Lorry and then the crisps are worth 9p then that's got to be a win, right? Surely it's not in their best interest to show these things unless they are actually in the bag. At this point I'm assuming that they are tiny, and made of that really cheap brittle plastic. 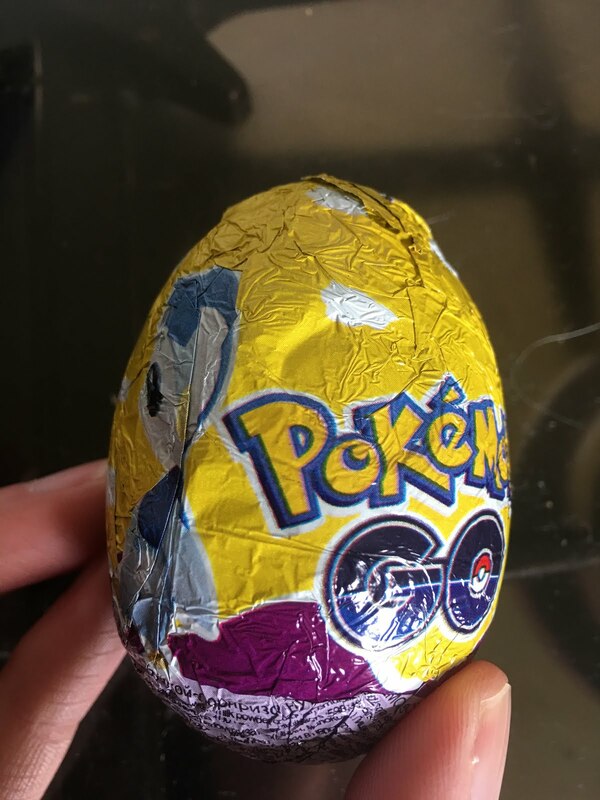 This Pokemon Go themed egg is not made by Kinder, or Nintendo or Niantic or anyone associated with anything other than cutting and pasting pictures off the internet. For a start the two Pokemon pictured aren't in the game yet - Piplup & Smugleaf are Gen 5 Pokemon and they are on Gen 2! There were other wrappers available (indeed some of them were non Pokemon themed which means I'm not holding out for a knock off plastic Charmander) I think those were Disney style things. I'll bet these are a more normal import and can be found in many corner shops so there may be less money going into import here and could lead to higher quality goods. So lets open them up! And here is the first surprise - this thing is pretty large! Yes it's cheap plastic, and the detail is all fairly basic, but this actually looks like a toy. If you'd gotten one of the plastic cars then It'd be fairly basic but OK. The lorry (and the tank that was hiding at the bottom) would have been pretty cool desk toys. This is a little babyish and doesn't really bob up and down as it's supposed to do when you wheel it. If you gave this to a child under 6 it would at least hold their attention on the drive home from the supermarket. Confusing, but not a disappointment! The crisps are essentially packing peanuts, with a little salt. They dissolve in the mouth and the aftertaste isn't offensive. I wouldn't really pay 10p for the bag of them though. I will probably put these in the communal snack area at work to generate confusion. Interestingly though, their appearance and the size of the toy means they could rebrand this as an unboxing! You get your pretend Amazon parcel and rummage through the packing peanuts to find out what gift you got. Oh! 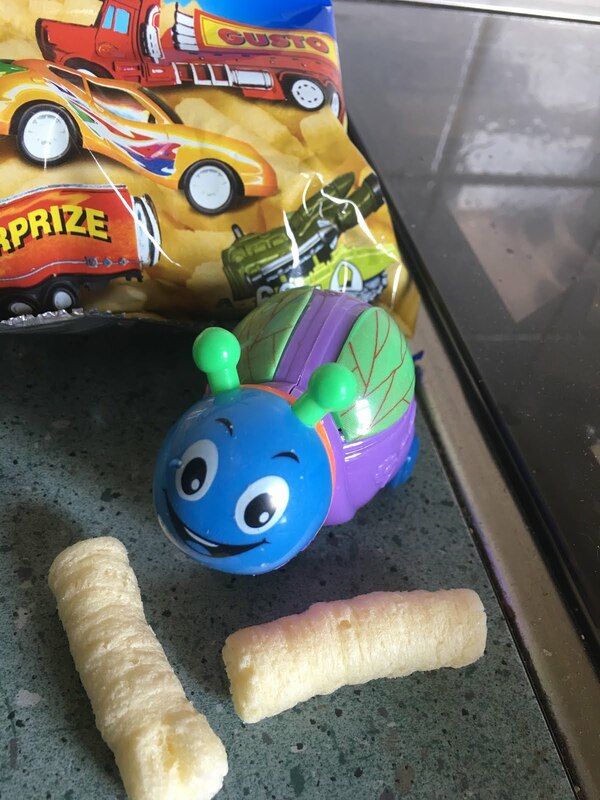 It's a child's beetle toy! And you can even eat the packing peanuts if you really want to. I'm sure this has been imported due to some nostalgia value and not as I initially hoped because the crisps are good. Seems a quick google confirms this - I suspect that over 90% of the crisps end up in the bin. 59p then is fair. I mean - you wouldn't actually buy the toy for 50p if you saw it, or the crisps for 10p if you'd tried them. I don't feel ripped off, and I was mildly surprised by the prize. You can watch someone open a whole load of the bags here. I'd say looking that their ten toys that mine was one of the worst available - they had Marvel AND Pokemon rip-offs on offer. Pretty much any of those toys would have risen the score sharply and caused repeat purchases. Still tempting. 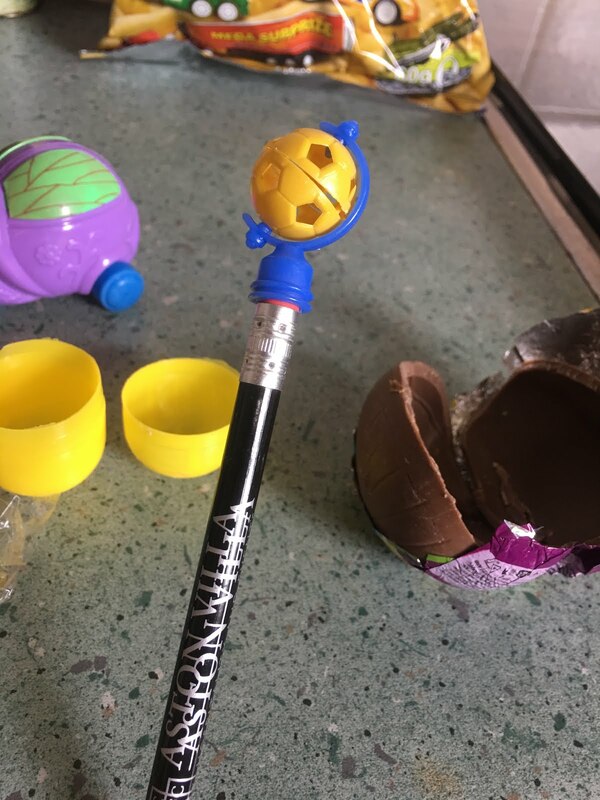 The prize from the Pokemon Go egg was a three piece construction project that gave you this football pencil topper. I put it on a pencil *liberated* from the Aston Villa football hospitality suite during a conference, but even AVFC's poor run of form doesn't deserve this. Even if you found a person that liked football, and whose team played in the odd choice of blue and yellow (I can't think of one? ), and still uses pencils I think they'd be disappointed. The capsule was so flimsy it went straight in the recycling - not even sturdy enough to give to the cats. I may have to drop the whole thing int he recycling - it's not something I could assign any value to at all. The chocolate is actually worse...! It looks like chocolate, but it tastes like it's made with oil and sugar and artificial brown. I'd feel bad letting the people at work eat this (I let my partner try some to confirm I wasn't being a chocolate snob, some-day she may forgive me). This makes the Gusto packing peanuts seem more like food. I'm not even labelling this review with the tag chocolate because frankly it isn't chocolate. This brown goo would make children cry. All of the 50p asking price seems to have gone on the foil. The foil is very pretty - in fact the most suitable way to deal with this product is to smooth out the foil, keep that and to bin everything that it contained! The only reason I can't score this lower was that my expectations were pretty low going in. And the item still was disappointing. So this means that it's a landslide victory for the Gusto offering. Even though I got no pleasure, only surprise, and don't intend to eat the actual food. Looking at the knock-off wrapper on the Pokemon egg, I'd give the chocolate a swerve. You're a braver person than me. 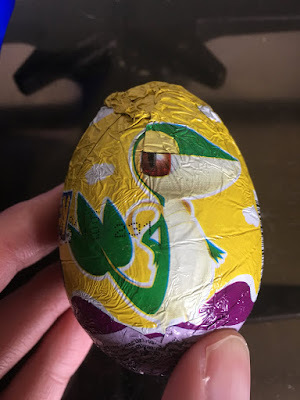 The lizard's name is Snivy, and Piplup is Generation IV!